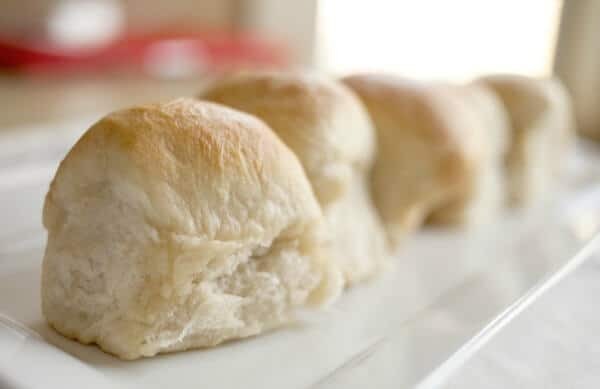 Soft, light, fluffy rolls are a must have for special dinners and you can’t go wrong with this super soft potato rolls recipe! They rise high and light, have a soft, squishy texture, and the flavor is delicate and slightly buttery. They freeze well, too! I wanted to have kind of a special dinner the Sunday before Matt left to go back to Okinawa. It was sort of a combo farewell dinner for him and happy birthday dinner for Erin. I wanted it to be something he would remember fondly until we get to see him again — usually well over a year between visits. So, rolls. In my family always rolls. These are some of my favorites — I don’t know why I haven’t posted them before. 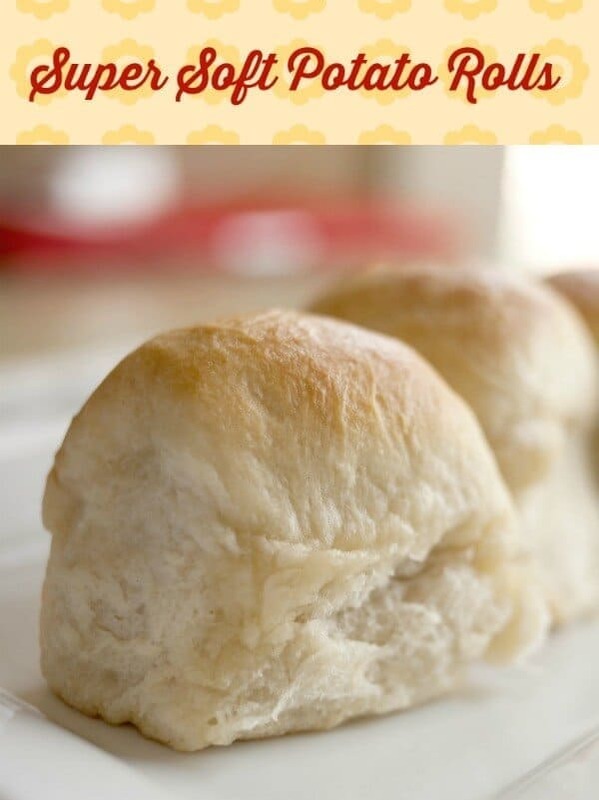 You use potato flakes and dry milk and it makes the rolls really airy and light. I have been making this for years (ahem… decades) and I think I got the recipe out of a vintage Farm Journal cookbook but I honestly can’t remember. I do know that it makes the best rolls ever… EVER. Honestly I like to take them out just a touch undercooked so that they finish cooking on the counter. The centers get just done and they crumple when you try to slice them to put butter on them. You can also double or triple the recipe and freeze them for anytime. When I was little we lived in Pennsylvania for a few years. We’d moved from Dallas just after JFK was shot and my dad said that for the longest time he just told people he was from Oklahoma. It’s funny now but back then there were some serious resentments. Anyway, we lived just northeast of Philly but on the weekends we’d drive out to Amish country. There was an amusement park out there called Dutch Wonderland and there was a buffet style restaurant out there, too. I can’t tell you how many rolls my dad could put away but I vaguely remember that my mom commented that it was embarrassing. These rolls are like that. They are so light you just keep eating them. The following is an affiliate link. Basically, if you click through and buy products I get a small commission which helps keep the blog up and running. Thanks so much! A lot of you have asked about yeast. I have to tell you that I like buying yeast in bulk from Amazon. It is WAY less expensive and if you are going to be making bread even once a week you’ll want to save this kind of money. Keep it tightly sealed in your refrigerator and when you are ready to use it measure out your yeast and let it come to room temperature. Classically soft, light rolls rise high. They are lightly sweet, mild in flavor, and are exactly right for any dinner. Double up -- they disappear fast. Add the yeast, sugar, and ginger to the bowl of your mixer. Add 1/4 cup of the water and let stand until frothy, about 5 minutes. Add the remaining water, salt, and 1 cup of the flour and mix until blended. Mix in the milk, potato flakes, and 1/4 cup butter. Add the remaining flour a little at a time until the dough pulls away from the sides of the bowl. Knead for 5 minutes on speed 2.
form the dough into a ball, grease the top with some melted butter, place in a greased bowl, cover, and let rise until double -- about 1 1/2 hours. Punch down, form into equal size rolls, and place in a pan with sides touching. Brush with butter, cover with a tea towel, and let rise until the rolls are puffy, about 45 minutes to an hour. Brush the rolls with butter, again. Bake for 20 to 25 minutes, or just until lightly golden. Remove from the oven and brush with remaining butter. These looks amazing! Is there any way to make them without sugar? you can make them with honey or maple syrup or agave if you prefer. OR, you can leave the sweetener out totally. It will change the flavor and texture some and the rise time will be longer. Those are some gorgeous rolls Marye! The perfect addition to any holiday meal! Great idea. Love the fact that they are eggless. Will try this one soone. Let me know what you think… I love them!! Thanks! I hope you love them as much as we do! I grew up North East of Philly! We never went to Dutch Wonderland though. We went to Dorney Park which I think was near Allentown. Love the line about your dad eating an embarrassing amount of rolls. Too funny!! 🙂 LOL, Katie! It is beautiful up there. I am so excited to try to make these rolls!! I have never used potato flakes or powdered milk in biscuits. They come out so light! I have never tried making them with mashed potato flakes. This I am going to try over the weekend. Yum! I love a light, airy, yeasted dinner roll. It’s basically heaven. Oh wow, these look fabulous! The texture looks so perfect. A side note – that is so interesting to me that your dad used to say y’all were from OK after JFK was shot in Dallas! I grew up in Dallas but I’ve heard SO little about people’s experiences of that day. Probably because my parents were kids and neither lived in Dallas at that time, but still. Really interesting to think about! Thanks Julie!! They are so good. Yeah, Texans weren’t very popular in many states. These look amazing! I love the idea of making a big batch (or two!) and then freezing them for later! 🙂 It really saves time. I love the texture potatoes give to rolls and bread. My mom used to make potato rolls every holiday. Your post brought back so many memories! 🙂 It does give an awesome texture. These are exactly the kind of rolls I want to eat! They look perfect! I love rolls with potato flakes. I make them the same way! It make them so light! I am thinking about making these for Thanksgiving. Have you ever tried making these ahead? Yes! You can make them like brown and serve rolls. Just bake them until they are done but haven’t started to brown yet. Cool and freeze then finish baking when you are ready!